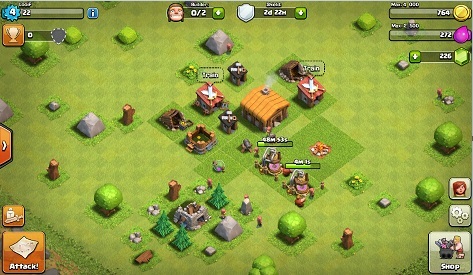 Here is Some Free Clash of Clans Cheats Tips to get Gems Be Careful There are Tons of Scam Sites Claim to give you free Clash of Clans gems they will steal your personal information only asking you to fill survey forum Do not under any circumstances trust any site that advertises free gems.if any one say he is providing Clash of Clans Mod unlimited Gems he is scamming if you try any trick or tool with your Clash of Clans Account Supercell banned you from the game. i am also playing Clash of Clans Game almost daily and try to get Gems Free like you but there is no way only these tips give you some Gems. When You Start Game First Time Clash of Clans will automatically be granted 500 free gems They Give you because you have to use 250 Gems on tutorial stages Don’t worry about rushing the building and troop production that the game gives you the choice of doing. Keep those Gems in hand. You can earn a small amount of free gems just by clearing out the debris like trees and rocks. Pay close attention to the in game achievements. By completing each and every one of them, you’ll come away with more free gems. Make sure you’re a part of the best ranked players in the top three clans on the leaderboards. You’ll receive free gems as a part of the weekly tournaments.1st place Clan will get 20,000 Gems, the 2nd place Clan will nab 10,000 Gems and the 3rd place Clan will be granted 6,000 Gems. Sometimes the random Gem Box will pop up right inside your village. These Gem Boxes will gift you with a free batch of 25 free Gems. If You Know any Trick Comment below and i share on my blog.